Italy's general election is turning into an extremely close race, with early results pointing to a slender lead for PM Silvio Berlusconi. Mr Berlusconi's centre-right coalition may narrowly retain control of both houses of parliament, according to projections from the Nexus pollsters. Earlier, exit polls pointed to a narrow lead for his centre-left challenger, Romano Prodi. In Rome, Mr Prodi said he was still hopeful for victory. Polling stations closed at 1500 on Monday (1300 GMT). Mr Prodi told supporters at a late-night rally he could not understand why the result was taking so long. The BBC's Jonny Dymond in Rome says Mr Prodi will almost certainly be a disappointed man when the votes are finally totted up. Mr Berlusconi appears to have kept hold of the Senate and is rivalling Mr Prodi's share of votes in the chamber of deputies - although our correspondent says adds a definitive result is still unclear. The Nexus projections, carried on the state broadcaster Rai, gave Mr Berlusconi's forces 49.9% in the Chamber of Deputies (lower house), and Mr Prodi's bloc 49.6%. 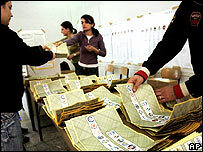 For the Senate the projections gave Mr Berlusconi's bloc 158 seats and Mr Prodi's 151. Another six Senate seats are for overseas constituencies, seven for life senators. The interior ministry says early estimates point to a turnout of about 85% - higher in the north than the south, with the lowest turnout being on the islands of Sardinia and Sicily. Mr Berlusconi, a billionaire, has led Italy's longest-serving government since World War II, but the economy has proven sluggish for much of his tenure. The formation of a new government would have to wait until after the election of a new Italian president next month. President Carlo Azeglio Ciampi's seven-year term of office is about to expire. The campaign was marked by acrimony, with Mr Berlusconi mocking left-wing voters and Mr Prodi likening him to a drunkard. Mr Prodi, a former president of the EU Commission, was narrowly ahead in most opinion polls until they were suspended 10 days ago under electoral law. 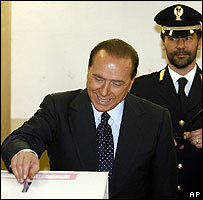 His mild-mannered - some say lacklustre - style contrasts sharply with Mr Berlusconi's media-savvy flamboyance. Mr Berlusconi has battled to fend off prosecution for alleged corruption and conflict of interest over his media empire. He accompanied his 95-year-old mother to the polls. A scrutineer reproved him, half in jest, when he showed his mother where to put a cross against his Forza Italia Party on the ballot paper, the BBC's David Willey reported. Mr Prodi, who beat Mr Berlusconi in a general election 10 years ago, voted in his home town Bologna. Both leaders face the tricky task of holding together broad coalitions. That task could be made harder by the new proportional voting system, which is expected to result in a smaller parliamentary majority. Mr Berlusconi, Italy's richest man, has struggled to translate his personal success as a tycoon into progress for the economy. Growth has slowed to an average of 0.6% a year. There is a chance, depending on which way the regions fall, that the coalition which controls the Senate may be different from the one which controls the Chamber of Deputies. That could result in a fresh election, as a "grand coalition" of left and right would be hard to put together after such a bitter campaign, analysts say.